– What if you discovered that your life works from the inside out? Jessie is seventeen years old, a runaway musician living rough in a trailer with a pit bull dog called Bear. That’s fine by Jessie; she’s got big plans. 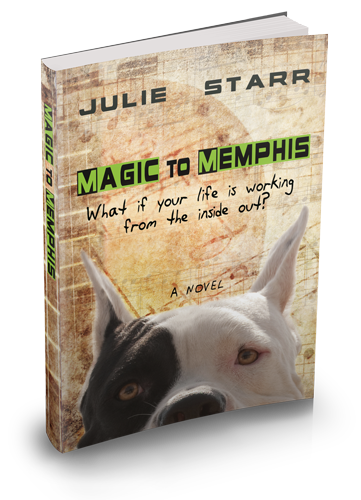 A music contest in Memphis offers the chance of money, fame and escape from a nowhere town with no real prospects. Turns out there’s more in Memphis than music. When Jessie’s mom sends her a box of things belonging to her dad, she finds out that he made the same trip years ago. She’s determined to find him, but has no idea that the ring her dad left her is being hunted by a sadistic killer. Nor does she realize that he will stop at nothing to get it back. Suddenly, a simple music contest turns into a fight for survival and only a puzzling traveler called Finch has the answers Jessie needs. But will she listen? And can she trust in herself enough to change her luck and make magic happen? Available in paperback and e-book, click the Amazon icon on this page.